We provide the perfect amenities for your outdoor events, big or small. We have a wide variety of equipment for single-day or long-term rental. Event Solutions provides quality emergency services to areas affected by natural disaster. Event Solutions of Lafayette and Sulpher, LA specializes in portable restrooms and portable toilets including restroom trailers, port-o-lets, porta potty rentals, portable toilets, shower trailers and a variety of sanitation solutions. We are a fully licensed and insured sanitation and waste service provider. We have a wide variety of equipment that we ensure are clean and functioning properly. Our equipment is available for rental for single-day or long term events. We can provide standard portable toilets (Port-O-lets), VIP toilets, Restroom trailers, Shower Trailers, Holding Tanks, Handi-cap toilets, Fresh water tanks, High-rise portable toilets and more. We pride ourselves in our dependability, quality service and honesty that sets us apart. 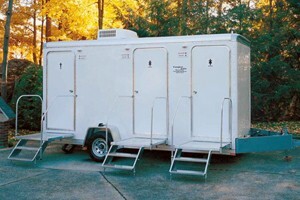 No matter how big are small your event is, Event Solutions will provide you with the portable restrooms and service you need. Event Solutions provides portable toilet rentals throughout Louisiana and East Texas with offices located in Lafayette, LA and Sulphur, LA. If you are in need of a portable restroom solution for your event or business; such as restroom trailers, port-o-lets or shower trailers, please give Event Solutions a call at the number below for your area.